If you can dream it, you can DO IT!!! 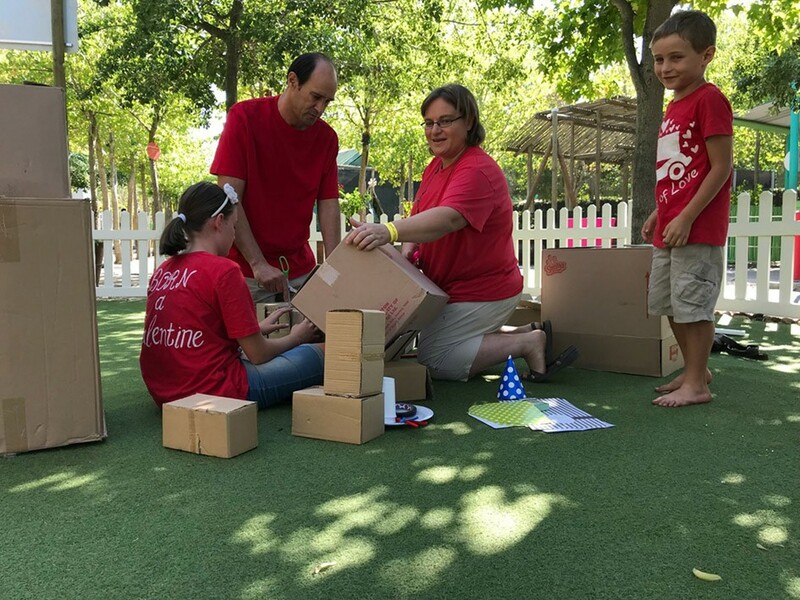 Well, we finally did it Bugz’ Family, we had our very own SUPER DUPER Building With Boxes day! HOORAY! For weeks and weeks we gathered all sorts - from off-cuts to recycled materials and so much more! We kept it down to just five families to make sure it was extra-special and super personal and invited the amazing kids from the Warrior on Wheels foundation to join in the FUN! FUN! FUN! This family had GINORMOUS plans and Asher made sure we knew ALL about his building talents. What a talented young guy. The family came prepared to go BIG. So big that we started doubting the amount of boxes! We think Asher soon realized that his BIG plans might not be possible in the two-hour timeslot and decided to down scale. In the end they created the perfect robot with a heart and a name. A magical masterpiece! GO TEAM! GO TEAM! GOOOOO! This group was in it to win it! Mom, dad and boys worked hand in hand the entire time and not once did anyone get frustrated with another member. It was smoooooth sailing, not one glitch or hitch! The proof is always in the pudding. Look at this robot with his very own speech bubble. Astounding! TWICE AS NICE! Just two, mom + YOU! Who? A boy who obviously has a GIANT LOVE for boats and singing. At some point we had to ask if he was working on a theme song for this event! This young man made sure mom worked extra hard to create a box boat, but one that is waterproof too! WOO HOO! The orange objects along the side apparently chase away sharks. Clever thinking indeed. Shiloh and Damian turned their wheelchairs into police vans for the day, the FUN way!Their moms had to get super creative turning flowerpots into hats and cups into sirens. Shiloh decided to go for polka dots and even added a smile to her wheelchair to make it more girly. So many giggles and a world of GLEE from the FUN police! YIPPEE! Five bugs, two parents, and an overload of creative juices flowing! Together they were UNSTOPPABLE and created the coolest rocket ship on earth! BUT WAIT! Just when we thought we’d seen it all they surprised us with matching rocket helmets ready for lift off. 3…2...1…OH WHAT FUN! During the course of the morning we realized we wanted to see SO MUCH MORE of our Bugz Master Box Builders. We loved hearing their stories and seeing how they truly lived our motto: learning through play, the fun way! They just HAD to visit us more often! We also knew that it will be impossible to choose a winner so the obvious thing to do was to invite them to Bugz for unlimited play for an entire year! Woo hoo! Here’s to building new friends, having new adventures, and adding to the Bugz Family. WHOOPEE! Psssst! To view all the photos of this cool event, simple click here!